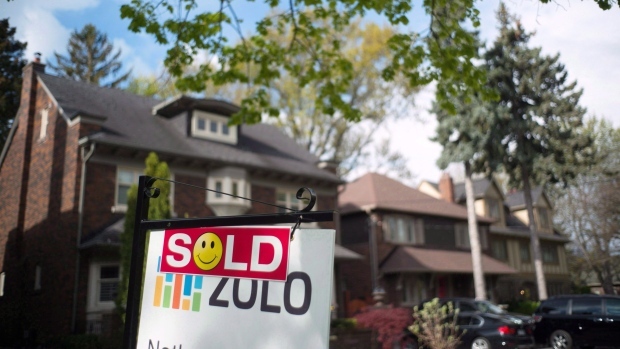 The country's overall real estate market remains "vulnerable" despite an easing in overvaluation in cities like Toronto and Victoria in the third quarter, according to a report by Canada Mortgage and Housing Corporation. The federal agency said Thursday that this is the tenth quarter in a row where it has given the national housing market a "vulnerable" assessment. CMHC said it changed Toronto and Victoria's overvaluation ratings from high to moderate when it measured it against factors such as population growth, personal disposable income and interest rates. Still, the agency noted that the country's overall vulnerability rating could be downgraded in future quarters due to signs that overheating and overbuilding remain low in some markets. "In Toronto, we've seen an easing of the pressures of overvaluation because house price growth has moderated and so the level of prices isn't increasing as quickly but fundamentals are still growing at a strong rate so there has been a narrowing of that gap between actual house prices and fundamentals," CMHC chief economist Bob Dugan said in a conference call with reporters. Dugan noted that the agency doesn't "target" any level of overvaluation in its report. "Overvaluation doesn't really have anything to do with affordability," he said. "In Toronto, you can have prices in line with fundamentals but that doesn't meant that affordability isn't a challenge. What it means is that there is a relationship between these fundamentals and prices that can explain the level of prices." The mortgage stress test, which is mandated by the Office of the Superintendent of Financial Institutions, came into effect in 2018 and has resulted in the cooling of some housing markets -- particularly in Toronto and Vancouver -- by limiting the ability of those with a more than 20 per cent down payment to qualify for mortgages. Earlier this week, the Toronto Real Estate Board urged Ottawa to "revisit" whether the stress test is still warranted, especially given the higher interest rate environment of today. Some bank economists have also recently called into question whether the rules around the test should be loosened. "What we've observed in housing markets is that we've seen a moderation in activity in many centres across Canada since the stress test has been imposed. But there are other things going on as well with respect to fundamentals which are contributing to some of the slower demand," he said. "We've seen mortgage rates inch up this year. There is a combination of factors. It is hard to isolate the impact of the stress test by itself but certainly it attributed to some of the slowing demand we have seen." Kevin Lee, chief executive with the Canadian Homebuilders' Association, said adjusting the mortgage stress test was one of the group's proposals to the federal government. Lee said he's had a number of meetings recently with the Prime Minister's Office and other government officials where he's shared the association's concerns about the lack of housing affordability. "The economic times have changed but the stress test, the way it was put in place, wasn't built to change no matter what the economic conditions...," he said. "We do think it's time to revisit it." "There have been so many changes at the federal and the provincial level over the past few years. We really felt like the changes were coming one on top of one another very quickly and the impact of them wasn't getting a chance to play out before the next change came," he said. "Our concern was just the compounding effect of all the different changes, one on top of another. That's unfortunately where we are right now."